RENO — Nevada Republicans wrapped up their state convention Sunday by approving a resolution denouncing supporters of the new commerce tax and adopting a conservative platform that includes gun rights, state sovereignty and opposition to abortion. The two-day gathering at the Reno-Sparks Convention Center was devoid of drama, a welcome departure from past conventions that were marred by infighting and ideological divides. 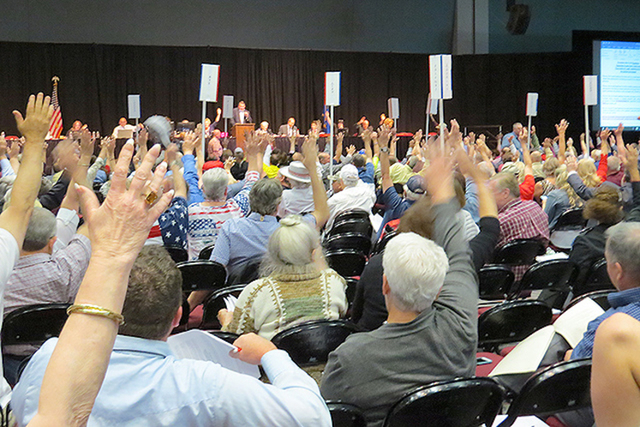 “This is probably the best we’ve ever had,” state GOP Chairman Michael McDonald said Sunday afternoon after delegates passed a lengthy party platform in one swoop. Saturday was all about choosing the 30 delegates to attend the National Republican Convention in July in Cleveland, where billionaire real estate mogul and reality television star Donald Trump, as the party’s presumptive presidential nominee, is expected to officially accept the GOP nomination. Nevada delegates rallied behind Trump, most enthusiastically but some reluctantly, to reclaim the White House and prevent another Democratic administration. On Sunday, the convention focus turned to Nevada and the upcoming state elections. Republicans, who rode a red wave in 2014 to take control of the Nevada Senate and Assembly, are hoping to stay in command, though they face an uphill challenge. Democrats hold a 64,000 voter registration advantage statewide. In Clark County, home to 70 percent of Nevada’s population, the gap tops 100,000. Conservative Republicans, still fuming over the commerce tax approved by the 2015 Legislature and signed by Republican Gov. Brian Sandoval, took their more moderate colleagues to task, passing a resolution denouncing their support of the tax. “How can we hold our legislators’ feet to the fire when they fail to represent us?” said one delegate who supported a resolution amendment to insert language denouncing those who supported the tax. Sandoval did not attend the convention. A proposed bylaw change to strip elected officials of their standing as automatic ex-officio members of the state party central committee failed. The measure, seen as another way to punish those who don’t toe the party platform or fail to participate in grass-roots effort, was defeated when critics said it would boot other Republican legislators, such as state Sen. Don Gustavson of Sparks, who actively participates at the local level and frequently butts heads with his moderate colleagues. While the convention was tame, it was not without some heated discourse over the direction of the party as a whole. An effort to shrink a seven-page party platform to a toned-down, one-page vision statement that eliminated stances on hot-button issues such as abortion failed after spirited discussion. Those who supported the simplified version said social issues should be left to individual candidates and removing them from the platform would make the party more inclusive. “I just don’t want to see our party die,” said Robert Olaveson, a Clark County delegate who supported the abridged platform. But others countered the party risked losing its identity if it remained silent. Delegates approved the expanded platform with a single vote without discussion. The platform calls for abolishing the IRS, repealing the Affordable Care Act, requiring voter ID, opposing same-day voter registration and eliminating minimum wage laws. Delegates also declared support for transferring federally managed lands to Nevada and negotiating with the federal government over “hosting the nation’s nuclear assets” at Yucca Mountain. The platform affirms the “sanctity of life” from conception through natural death and opposes government funding of abortion. On immigration, the platform opposes “amnesty, government benefits or other special treatment” for those in the country illegally, as well as automatic citizenship for children born in the United States. The convention did not finalize endorsements for state office candidates because of time constraints with printing and counting paper ballots. Results will be posted later on the state GOP website. Contact Sandra Chereb at schereb@reviewjournal.com. Find @SandraChereb on Twitter.